Romantic Couples beach & sunset portrait photography sessions include all the wonderful ways we express our love for another person - from engagement, vow renewal, boudoir, anniversary, wedding, proposal, honeymoon and wedding photography. Couples beach sessions are outdoors on location, at the beach or a local park, and range from one hour to several hours depending on the package desired. The Hawaiian Package is the most popular with couples wanting the most creative, gorgeous portraits Hawaii nature has to offer. LGBT and Alternative Lifestyle couples are always welcome. 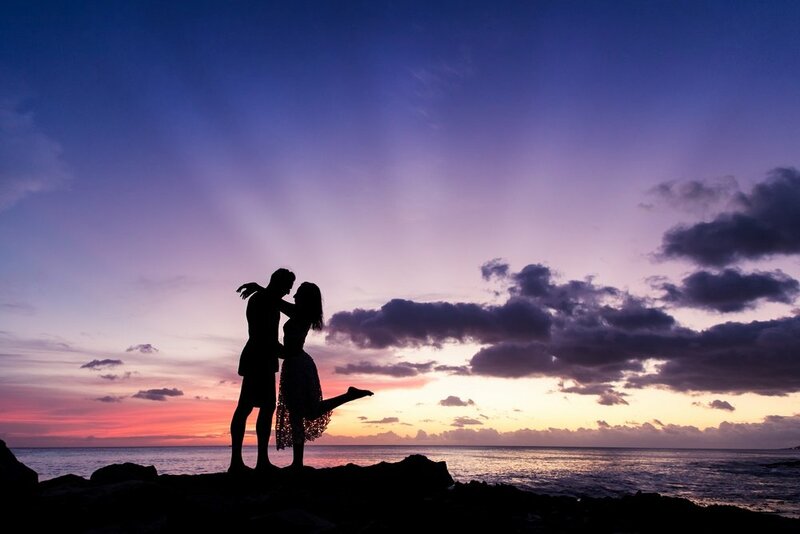 Waikiki romantic couples sunset photography is for sweethearts of all kinds and ages! Locations can be almost anywhere on Oahu, from Waikiki beaches to lesser known, off-the-beaten-path beaches and Bodhi will happily recommend several according to your needs and desires. The best time of day for romantic couples photography is early morning or late afternoon for the softest, warmest light, however, sessions can be mid-day as well. To reserve an Oahu couples beach photography session, a deposit is required and is refundable if canceled more than 72 hours before your session. Refunds are NOT given for anything beyond Bodhi's personal control - like weather, wind, sunburns, rain, wet clothes, etc. Rescheduling due to weather is at the discretion of Bodhi*. Within a few days of your couples beach & sunset photo shoot, your images will be uploaded to an online gallery for viewing and downloading. Upon receipt of final payment, you will be able to download the digital images included in your package directly to your computer. High quality prints, enlargements and additional products such as collages and photo books are available for purchase right from your online gallery as well, if so desired. Please visit the FAQ's page for more information about Oahu couples beach portrait photography sessions - what to wear, location ideas and more. A 60 minute couples portrait session, includes ALL digital images* and $100 of print credit**. NOTE: This package is not available for sunset or sunrise sessions. A 90 minute couples photo session that includes ALL digital images* along with $200 of print credit**. Good for any location on Oahu and for sunset/sunrise sessions. Our double session option for couples who want the maximum variety of images and backgrounds (often used for a surprise proposal/engagement) or split into two locations/sessions of 60-90 min each (ex: one morning/day session, one sunset session) . Includes ALL digital images* along with $300 of print credit**. Thank you! Expect to hear back from us within 24 hrs! The average couples portrait session typically results in 150-350 images. After your couples photo session, your images professionally edited for clarity, exposure, color and composure and typically finished within two days. You will be sent an email link to view and download your images as well as select the prints using the Print Credit included with your package. The option to purchase additional digital images as well as prints large and small, photo books, collages and other products will be available from the gallery, if you so desire. We have a secret soft spot for couples in love! We are Oahu's number one engagement and honeymoon photographer. Along with engagement photography and honeymoon photography, Oahu Pro Photography specializes in anniversary, surprise proposals, vow renewals and wedding photography as well. If you're in love, we would love to be your photographer! Contact us today to schedule your couples session. Sunsets are limited! - Book Your Romantic Couples Portrait Session Today! Next, click here to make a deposit to confirm your reservation. Deposits are applied towards any package you purchase. Schedule Your Romantic Couples Portrait Session Now! Oahu Pro Photography specializes in romantic engagement photography, surprise proposal photography, destination wedding photography, anniversary photography and vow renewal photography. We love couples in love!